Thank goodness for NYC brunch. I lived in Boston for 8 years and brunch isn’t something that is necessarily “done” there. As all New Yorkers know, brunch in NYC is the perfect way to spend the day of rest – hanging out with friends, having a light afternoon cocktail. This past Sunday, Jayson and I made our way to Joseph Leonard for brunch. We’ve been to Fedora and loved it but haven’t been to Joseph Leonard. We arrived to a 30 minute wait – not too bad. The waitress took our mobile number and gave us full rein to leave the premises to wander and she called when our table was just about ready. We had strolled over to Jeffrey’s Grocery with the intent to pick up something for dinner later on. We hadn’t been there for a good few months but had remembered that they had a refrigerated display case of prepared food for those that didn’t want to wait for a table. Apparently it had been a year since we had strolled by because they removed that part of the business to add more tables and expand their menu – and business (and future business) is what they received from us. Although we had a glass of Brut, we wished we had the “Bloody Caesar” that the gentleman sitting next to us was drinking. It comes with an artichoke, a clam and a shrimp! It looked delicious! Also on the menu was a Maine Crab & poached egg dish that also looked amazing. Sticking to the plan we returned to Joseph Leonard but made a promise to ourselves that we’d be back to Jeffrey’s Grocery for brunch another day. (photo courtesy of nymag.com) I didn’t realize how small Joseph Leonard was. I think it probably only has about 50 seats. We were lucky to be sat in the back in a cozy corner at the “chef’s table” which is always nice to be able to chat with the cook and have your food served directly from him to you. Now – let me preface, we ordered very typical items for both of us and I was very curious as to what the hype was about this place. 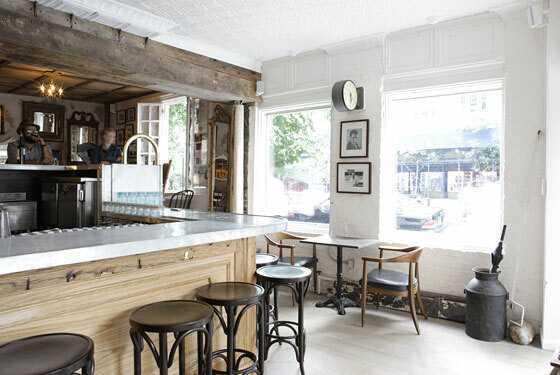 One reason it has taken us this long to check out Joseph Leonard is because I thought it was just another “see and be seen” hot spot in the West Village. Conclusion? It is by NO MEANS a typical brunch and I will make sure I am seen there more often! Everything went that extra step to satisfy every taste bud in our mouths with just one bite. We DEVOURED all of it and enjoyed it so much that I forgot to take pictures of what we were eating. (photo courtesy of sweetcarolineinthecity.com) Jayson ordered the fried chicken sandwich (shocker!) and on it was mayo, tabasco, honey and bread and butter cucumbers. He also ordered a side of the bacon which was also fried and drizzled with honey and tobacco. The chicken and the bacon looked like it was burned or over fried by the dark-colored crusting of it. NOPE it was perfect! 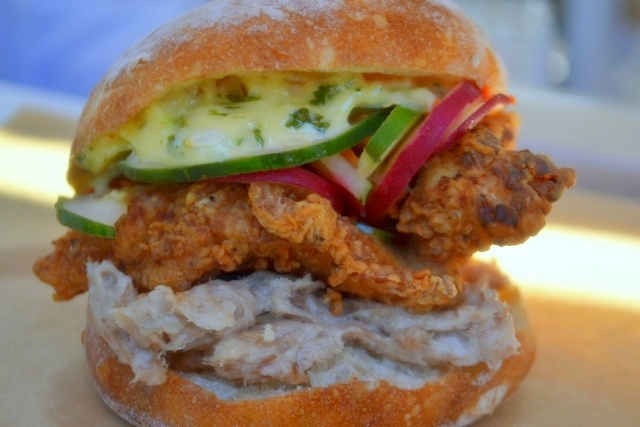 A perfect combination of sweet, salty, citrus and just enough bun to keep it all together! YUM! (photo courtesy of chubbyhubby.com) I ordered the grilled chicken salad with the mustard vinaigrette dressing on the side (I know – another shocker!) 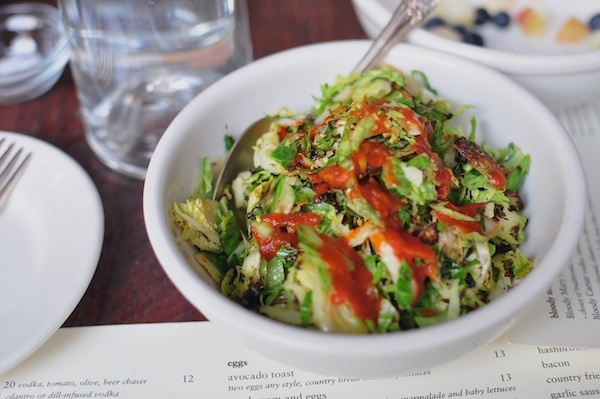 and the side of sriracha brussel sprouts. For those of you that don’t know what sriracha is, it is a Vietnamese red hot sauce almost as thick as ketchup. It’s sold in a most grocery stores. My salad was so flavorful, it really only needed a tiny bit of the dressing. And brussel sprouts tasted just like what Jayson makes at home. Cooked to the perfect crunch, not too hard and not too soft. As you can tell I am so excited about this meal and can’t wait to go back for dinner. I’d love to hear what restaurant exceeded your expectations or email me for another suggestion that I can’t wait to get back to! This entry was posted in hungry? and tagged brunch, fried chicken, jeffrey's grocery, joseph leonard, west village. Bookmark the permalink.